It’s looking like a good week for game stacking EDM/WPG with an EDM double stack of receivers and Andrew Harris cleaning up the garbage underneath coverage. WE’RE ON TO WEEK 15! After weeks of tweaking and tinkering, we are finally at a place where we are comfortable sharing our projections with you our loyal readers. I’ve had a number of GPP wins this season, along with other high finishes, that have given me confidence in our product. Other sites might offer you generic player rankings and statistics, but this is the only place you’ll get access to actual projections to work from in building your lineups. We are offering them to you for $5 per week or $25 for the rest of the season. Come find me on Twitter @benyamen for details. This isn’t a DailyRoto premium subscription at this point, just access to our projections, but coupled with our weekly slate breakdowns and twitter chat, we think it’s a pretty powerful edge to have in CFL contests. It’s no surprise that Calgary has the top implied total on the slate versus the woeful Alouettes. As I’ve been saying here for weeks though, don’t let that fool you into stacking the Stamps offence. This is a bad offence without Kamar Jorden and DaVaris Daniels. They lack downfield threats to stretch the defence that leaves Messam running into stacked fronts all day. The defence will likely account for one score again this week against Drew Willy, and Roy Finch is always a threat. The most notable thing though may be the -17 spread. Those are numbers from an opening week SEC game versus a Div II cupcake opponent. I have rarely seen a spread that big in a professional football game. I guess it makes sense given the Als are far from a professional organization at this point. The other surprising line for the week is the Riders being only 3 point favourites over the Ryan Lindley led RedBlacks. Ottawa managed only 9 points last week against a significantly more porous defence in Winnipeg, so it’s hard to see a path to them scoring 23 versus a very stout Riders defence. The RedBlacks defence is fine. I can see them limiting Saskatchewan to 26 points minus Naaman Roosevelt who’s out in concussion protocol, but I would be shocked if Ottawa can manage over 13 points this week. Ottawa has a lot of talented receivers, but Lindley lacks that basic skills to distribute the ball. Picking up where we left off in the introduction, it should not shock you to find out that Winnipeg allows the 2nd most pass yards/att, 3rd most rush yards/att, 2nd most pass TD/att, 2nd most rush TD/att, and projects to allow the 2nd highest scoring rate in the air and on the ground along with the highest yards per pass attempt this week. Let the suckers believe that Edmonton’s struggles against them in the first half of their game a month ago is the Edmonton they’ll see Saturday night. Winnipeg is an awful place for opposing teams to play and this game is in Edmonton instead. I expect the Eskimos will come out firing on all cylinders with all their offensive players intact, ready to break their losing streak. Reilly is ridiculously priced LOWER than Matt Nichols this week despite being projected a full 20% higher. Make your Reilly stacks with great rejoicing and clapping of hands. Kevin Glenn comes in second in our projections, but he’s not remotely close to the projection of Reilly. There’s a large gap here. Glenn’s matchup versus Ottawa is a mediocre one in terms of yards passing allowed, but is actually the 2nd toughest matchup in the league in terms of passing TD/att allowed. The Riders lead the league in passing TDs this season, but minus Naaman Roosevelt, they are without one of the most consistent weapons in the league. Glenn is still a fine play, but his ceiling is lower than it might be on other weeks. The third passer in our projections is Matt Nichols, who also happens to be the top priced option on the slate. That’s kind of ridiculous. Winnipeg is once again without Weston Dressler at SB, and will field a starting five of Adams/Lankford/Denmark/Flanders/Feoli-Gudino. Two of those players were cut by the Bombers previously and one of them is a running back. This is a diminished group to pass to at best. I’m still kind of at a loss as to how Thorpe and Washington couldn’t hold a starting job here. Despite their losing streak, the Eskimos are still an above average defence versus the pass in terms of yardage and scoring rates and the addition of Aaron Grymes to their secondary this week only makes them better. This is not a matchup I would want to attack heavily, let alone with the highest priced QB on the slate. It may be that a whole lot of dumps underneath coverage to Andrew Harris will be the game plan in Edmonton. As I mentioned with the Matt Nichols matchup, this is likely to be a solid Andrew Harris week. The Eskimos have been gashed on the ground all season, including their last game in which they allowed 190 yards rushing and over 40 fantasy points to James Wilder of all people. The Eskimos have been to rush defence, what the Ti-Cats have been to pass defence in 2017, allowing 6.3 yards per carry which is a full yard over the league average. You want to attack this matchup pretty much every week. Harris will likely find the going fairly easy in the rushing department and is likely to see a large number of targets in the passing game given their depleted receiving corps. I’m not saying he should be in every lineup, but you certainly want to be overweight on him in multi-entry tournaments this weekend. I’m still not sure what to make of James Wilder. He’s an enigma, wrapped inside a riddle, that I’m really not sure I want to deal with. His gargantuan numbers over the past two weeks in which he’s amassed 330 rush yards on only 21 carries, along with 144 receiving yards on 13 receptions are more nearly double what he accomplished through his first 11 games in the league. In his only other double digit carry game on the season he average a mere 3.2 yards per carry. It’s ridiculous. Yet here we are staring at a guy who’s amassed over 78 fantasy points in the past two weeks and he’s not even the top priced option at his position. I think you’d be crazy not to have some exposure to him, but equally crazy to invest too heavily on a two game sample size as well. No one can keep up this production level, averaging 15.7 yards per carry and having a 100% catch rate. The Ti-Cats have a well earned reputation as a bad defence, but they allow the fewest yards per carry in the CFL. They allow a lot of rushing TDs, but that’s usually after the opposition has passed at will all the way down the field. The Argos only had to run 38 offensive plays last week to score their 33 points. I expect their volume will be much higher this week versus Hamilton. Ram Messam into the defensive front all game, avoid turnovers, and let the defence win it. In two games versus the Riders this season Messam has had a whopping 51 carries. He hasn’t had over 17 carries in any other game and actually only averages about 12 carries per game otherwise. The game this week versus Montreal figures to be a blowout early, and the Stamps have shown a tendency to rest starters in the second half of games when they’re out of reach. This may be a low volume week for Messam, despite the implied run heavy game script, and may actually lead to increased touches for Finch and company. It’s quite possible he has a couple TDs that give him value, but I wouldn’t invest heavily in Messam despite the implied totals. A couple of the better value plays of the week are at the RB position with Alex Green expected to get his 2nd start for Hamilton after a great debut, and with Tim Flanders increasing role in the Winnipeg offence. Green ran roughshod on the Lions last week gaining the Ti-Cats first 100 yard rushing performance of the season. His matchups versus the Argos this week is a fair bit more difficult and he still only looks to get 8-12 carries in the pass heavy Hamilton offence. At only $5600 though, he’s certainly worth consideration. In other news Mike O’Shea continues to think he’s smarter than everyone else, smugly listing Tim Flanders as a SB and then giving him a season high number of carries. Flanders role in the passing game will likely at least hold, if not increase, with Dressler out, so a guy with a handful of carries and a half dozen targets in the passing game is a reasonable value at only $4900 versus the weakest rush defence in the CFL. It looks like Messam will be resting this week and Terry Williams will get the start for the Stampeders. He’s not in the DK player pool, so he’s not an option. On the bright side, it may mean increased looks for Roy Finch who becomes an option at that point. Chambers old teammate Derel Walker is our top projected receiver this week in a juicy matchup with Winnipeg. Walker isn’t $4000 anymore, but at even double the price he’s the best option on the slate. 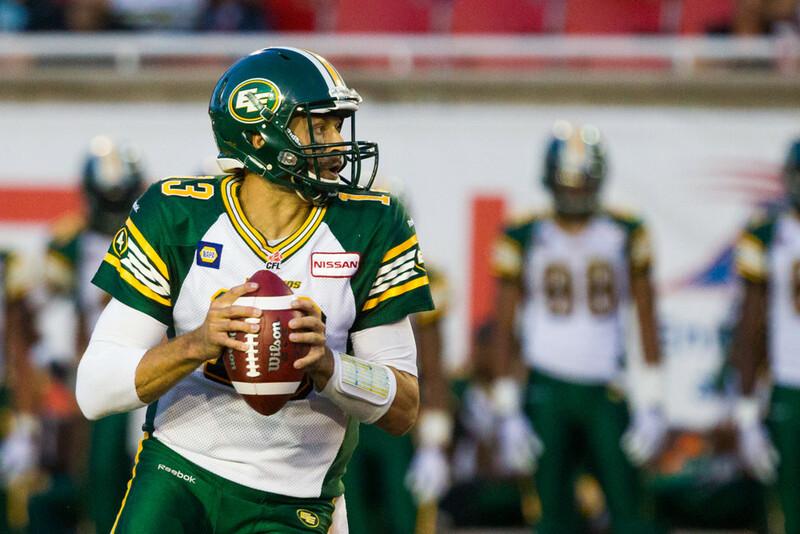 Walker has been averaging 10.5 targets per game since he returned to the Eskimos and now gets a bump in efficiency as well in this matchup against the Bombers. Anytime you can get guaranteed volume it’s a good buy. When you can get guaranteed volume AND high efficiency it’ s a heavy buy. Walker’s teammate Brandon Zylstra has been a model of consistency this season and is $500 more expensive, making him a good option too. It’s a great week for Reilly/Walker/Zylstra double stacks. If you throw in a smattering of Duke Williams too, you’re off to the races. Nestled in between Walker and Zylstra is the top target for the Riders passing offence which leads the league in TD passes – Duron Carter. With Naaman Roosevelt out, it’s likely Carter sees a slight bump in targets while the rest of Rosie’s 10 targets per game get spread out. The RedBlacks secondary doesn’t provide a great matchup, but hopefully Carter’s ankle injury is mostly healed and he can lineup at full strength against the team that allowed Darvin Adams 7 receptions for 195 yards and a TD at the same boundary WR position a week ago. Bakari Grant looks to see a similar uptick in targets with the loss of Rosie, but is also priced over $2K cheaper this week. Grant has quietly average 6.5 targets per game this season and at least 8 in each of the past two weeks. As I mentioned with Kevin Glenn, Ottawa is a middling matchup at best, so the ceiling isn’t as high as you might like. Sandwiched into the middle of the Edmonton and Saskatchewan goodness, is poor SJ Green. He’s talented but aging, and despite his strong mean projection he’s tough to get excited about even in a great matchup versus Hamilton. With James Wilder ripping off long runs the Argos offence has been way down in volume the past couple weeks despite strong projections. He’s been fortunate enough to score TDs in each of the past two weeks to salvage some value, but he’s really an all or nothing candidate at this point. He’s had 5 games over 20 points, 4 games in single digits, and the rest in the low teens. It’s hard to justify paying up for him as the highest priced option on the slate. The matchup is good, and James Wilder’s pace can’t continue, but it’s hard to see Green as anything more than a GPP sprinkle despite the matchup. Armanti Edwards on the other hand is somewhat similar to the Bakari Grant option in that he’s price $2-3K cheaper than his teammate, but also projects for solid volume at over 6 targets per game. It seems more like a studs and duds kind of lineup construction week, but if you are looking at building more balanced lineups, he should be in consideration versus Hamilton. As I said earlier, the Winnipeg receiving corps is pretty thin right now, and so it makes sense that Darvin Adams will likely see a heavier work load going forward. He showed his ceiling last week versus Ottawa, but gets a much tougher assignment this week versus Edmonton and the likely return of Aaron Grymes to work against. Adams has seen his price rise over $8K again which hurts his value a bit. With the other options in the same price range, it’s hard to see investing too much in Adams despite the healthy team total. His less expensive teammate Clarence Denmark is worth some consideration due to his cost and likely increase in work load. Denmark saw a fair bit more usage while Dressler was out last time, and it would make sense he would again see a couple more looks in the passing game as the only other established veteran in the receiving corps. The Calgary duo of Marken Michel and Reginald Begelton – herein Bageltown – don’t project all that well despite having the highest implied total on the slate for the reasons mentioned before. The Calgary offence has been quite poor without its two leading receivers – Jorden and Daniels – and the receivers have been asked to do very little overall with the defence leading the way. There’s certainly a chance that they have breakout games versus the woeful Alouettes led by Kavis Reed. I have a hard time believing Michel can possibly produce well enough to justify a $7K price tag, and I felt much better about Bageltown around $3K than I do with him at nearly $5K. That said, if Reggie continues to produce at a similar rate, he’s certainly capable of 3x value versus a team that just doesn’t care anymore, even if there are threats of CONSEQUENCES. Rounding out the value bin are Caleb Holley and – ugh – Shamawd Chambers. Holley will see a return to the starting lineup with the Riders loss of Roosevelt and should get a half dozen targets in a very efficient passing offence. I’d like him more a few hundred dollars cheaper, but he’s certainly a fair option for salary relief this week. That leaves – ugh – Shamawd Chambers. Chambers is a very valuable blocker in the running game, and he’s Canadian, so he maintains some value in real football terms towards the ratio for CFL teams. If he were American he wouldn’t be in the league. That said, he did get 6 targets at the field WR position versus BC last week in his first start for Hamilton. I think that’s likely his ceiling. He turned those 6 targets into 6 receptions for 57 yards. That’s nothing to get excited about, but it is solid 4x value with him priced at only $3000. That low a price really opens the doors to spending up for multiple elite players, so he’s worth some consideration. If he flatlines, even giving you a Jalen Saunders like 0 for the day, it’s not a huge loss. Unlike week 14, there’s really only a couple DST units worth serious consideration this week. You’d be well justified to just lock the Stampeders DST versus MTL and walk away. They average 12.6 fantasy points per game and face the worst team with the worst offence in the CFL that is in total organizational disarray. The Stamps are always a threat for a defensive of special teams TD, having accumulated 7 already through 14 weeks. There’s not safe option this week. Likely, there’s no option with a higher ceiling this week either. If you want to play the game theory route a bit, you can make a case for some minor price savings and lineup differentiation by playing the Riders versus Ryan Lindley or the Argos versus the Masoli Turnover Machine. Lindley completed just 44% of his 36 passes versus the dreadful Winnipeg secondary and looked completely uncappable of leading a CFL offence despite his very talented receiving corps. He’s turnover prone as well making the Riders a candidate to allow few points, create sacks and turnovers, and potentially score as well. If you want to differentiate further, Toronto is a fair option, but the vast majority of your exposure should likely be to Calgary and Saskatchewan. Well, that does it for week 15. We’ll keep updating this article throughout the week as depth charts roll out and projections adjust. Be sure to join in the conversation in the DailyRoto Forum and hit us up on Twitter at @benyamen or @RealestChrisKay. Enjoy the games, and good luck in all your contests!